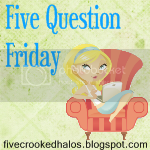 I'm hooking up with 5 Question Friday Again!!! 1. Is love at 1st sight possible? 2. How did you choose your pet's name? 3. What are you considering giving up (cable, home phone)? 4. How much do you pay your babysitter? 5. How "young" is old enough to babysit? I started babysitting at 11... but I think it truly depends on the maturity and abilities of the individual being considered... and the children involved... with Liam having special needs and Erik being a 'Terrific Terrorist' these days I hesitate to leave them with anyone under 18.